The coming of age story of three friends, refugees who fled Africa and left their families behind, learn today in Israel and dream of following Avi (Formally Ibrahim) - the only refugee who obtained Israeli citizenship and joined the IDF. The three start their senior high school year, at its end it will be clear whether they will do the impossible and join the IDF or be deported back to their countries - which mean certain death to them. 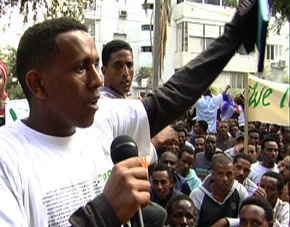 Our subjects deal with familiar teen-aged issues such as falling in and out of love, tradition and progress, Idealism and reality; but their story takes place in a turmoil, social and political reality - and their unique point of view gives us an original and stimulating look on the African refugees' problem - in Israel and worldwide. Inbal holds an undergraduate degree in cinema and a BA in communication from Kinneret College, and a BA in teaching from Oranim College in Israel. In 2009 she directed, shot and edited her debut film 'Reality 48', a short documentary that portraits life in a Kibbutz next to the Gaza border during the first 2 days of a military confrontation there (Gesher Film Fund, Channel 8). 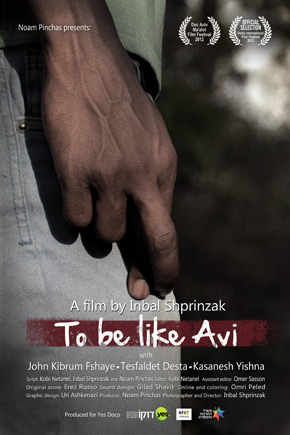 In 2012 her second film was premiered, 'To be like Avi' (Yes Docu, NFCT, Haifa International FF), that addressed the African refugees in Israel subject through the touching story of three teenagers. Inbal is also working as a freelance filmmaker, producing corporate films for top Israeli companies, and teaches in the communication department in high schools. Inbal continues and strives to be a partner in documenting important characters and moments in Israeli society, and to never stop learning.